St. Dominic’s is a Catholic parish inspired by Dominican spirituality igniting faith for the salvation of souls. and promoting apostolic activities within the Parish and the Universal Church. St. Dominic’s Rectory was built in 1956 and the old Seminary dormitory was torn down. In March of 1961, St. Dominic’s Parochial School was opened on the corner of 5th and East J Streets. This school is still in operation today. A committed community of parents, teachers, staff, and church congregation support its development. Together, St. Dominic’s Church and School provide a strong spiritual and academic presence in a growing Benicia. Perpetual Adoration ensures the 24-hour continuous adoration of our Lord Jesus Christ who is truly present body, blood, soul, and divinity in the Holy Eucharist. Parishioners are encouraged to have a regular scheduled weekly hour of adoration. All parishioners are invited to stop in unannounced for adoration during the daytime hours. The Garden of Hope is intended to offer a quiet place to reflect on the hope and healing that flows from the infinite love of our Lord. The garden is located at the northwest corner of the church, adjacent to the schoolyard, in a shaded area of the property. The design is centered around a memorial wall and water feature surrounded by a series of raised planters which hold flowers, symbolizing the beauty of life. The memorial wall in the garden is a visible sign that offers hope and healing for hearts broken by abortion or miscarriage. If you would like to have a leaf dedicated of a deceased infant please call the office. This beautiful sacramental garden provides us all the opportunity to come and sit among the flowers and fountains and reflect on God’s love and peace. In the early 13th century a Spanish priest named Dominic de Guzman, while traveling with his bishop, encountered the Cathar heresy spreading through southern France. Cathars believed that the physical world was evil. They denied the incarnation of Christ, the efficacy of the Sacraments and the goodness of creation. St. Dominic recognized the need for educated and prayerful men to preach the truth of the Gospel to Cathars and bring them back to Christ. Gathering a band of 16 preachers, he founded the Order of Preachers in Toulouse, France, in 1216. In his approval of this new Order, Pope Honorius III noted that the need for educated apostolic preaching extended beyond the region of southern France. Within a year, St. Dominic split his band of brothers and sent them into Spain and northern France for further education and to continue the work of preaching the Gospel. By the time of his death in 1221, there were more than 200 Dominican Friars living and preaching throughout Europe. In the centuries that followed, the Order spread to Africa, Asia and the Americas. Today, there are more than 5,000 Dominican Friars. They continue the mission begun by St. Dominic of preaching everywhere the name of our Lord Jesus Christ. It is done with fullness of mind and openness both to the Spirit of God and to the hearts of those to whom the word of God is being preached. In 1850, the first Dominicans came to the west coast of the United States during the California Gold Rush. Fr. Peter Augustine Anderson, OP. celebrated the first Catholic Mass in the goldfields and established the first parish in what became the city of Sacramento. During this time, the city of San Francisco became the seat of a new diocese. The first bishop selected in 1850 was the co-founder of the Western Dominican Province, Fr. Joseph Alemany, OP. Presently, there are 150 Dominicans assigned to 18 communities in the western US and Mexico. The friars have houses in every major city in the West extending north to south from Anchorage, Alaska to San Diego, California and east to Salt Lake City, Utah. The province is formally called The Province of the Most Holy Name of Jesus. For almost 160 years, St. Dominic’s has maintained a strong spiritual and academic presence in the once-state-capital town of Benicia, California. In 1854, the Dominican priest, Fr. Francis Vilarrasa, sailed from Monterey, where he had founded Santo Domingo Monastery, to the thriving city of Benicia. After arriving on March 16, 1854, the Dominican community occupied the property bound by East I and J between 4th and 5th Streets as a Dominican Seminary. In August of the same year, Mother Mary, who had made the first journey with Fr. Vilarrasa from Rome, arrived from Monterey with other Sisters and some resident students to set up school in Benicia. She bought several frame buildings in the hollow at the north end of 1st Street where she founded St. Catherine’s School. The Seminary grew and prospered with the building of St. Dominic’s Church, which was dedicated in 1890. In the early 1930’s, the Seminary and House of Studies were moved elsewhere. St. Catherine’s, however, was in continuous operation for more than a century until 1966, when ten of its buildings were demolished. The Solano shopping center now occupies the site. St. Dominic’s Rectory was built in 1956 and the old seminary dormitory was torn down. In March of 1961, St. Dominic’s Parochial School was opened on the corner of 5th and East J Streets. This school is still in operation today. A committed community of parents, teachers, staff, and church congregation support its development. Together, St. Dominic’s Church and School provide a strong spiritual and academic presence in a growing Benicia. Fr. Francis Sadoc Vilarrasa y Costa, O.P. was born August 9, 1814 in Catalonia, Spain. He entered the Dominicans at the age of 15 and was ordained May 16, 1837. After volunteering for the American missions and laboring for five years in the Province of St. Joseph (eastern Province) with Fr. Joseph Alemany, OP, he was invited by the new Bishop Alemany to accompany him to California. Pope Pius IX had given Fr. Alemany, who attempted to resign as Bishop, a clear mandate: “You must go to California: there is no alternative, where others are drawn by gold, you must go to carry the Cross. God will assist you.” On July 18, 1850, the Province of the Holy Name of God was established with Bishop Alemany as first Provincial and Fr. Vilarrasa was assigned to the missions of California. After establishing the Convent of St. Dominic in Monterey, Fr. Vilarrasa came to Benicia. On March 17, 1854, Fr. Vilarrasa celebrated his first Mass in Benicia. The city had a church built, but it had a debt of two thousand dollars and was not consecrated. 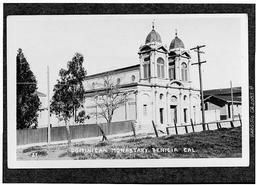 The Dominicans moved to Benicia March 31, 1854. In 1855, they built the convent and enlarged it the next year. They incurred a debt of seventeen thousand dollars and paid it off over a period of fourteen years. Finally in 1857, Fr. Vilarrasa had the joy of seeing two of his novices ordained to the priesthood. Fr. Vilarrasa describes the situation in some detail: “In order that I might the easier provide for the spread of the Order… I transferred the convent of Monterey to Benicia by a letter dated March 31, 1854. Benicia is a small city located on the straits of the Sacramento River which are called Carquinez, and is a distance of twenty-seven English miles from the city of San Francisco. This city was founded in the year 1847 by the Mexican general, Señor Mariano Vallejo, who gave it the name of his wife, Benicia…There already then existed at Benicia a church recently built and intended for a parish but not at all finished and furthermore burdened with a debt of two thousand dollars. This the Archbishop gave to the Order. We built a very humble house without cells, such as we had at Monterey, and for this purpose the Archbishop assisted us with a sum of five hundred dollars. 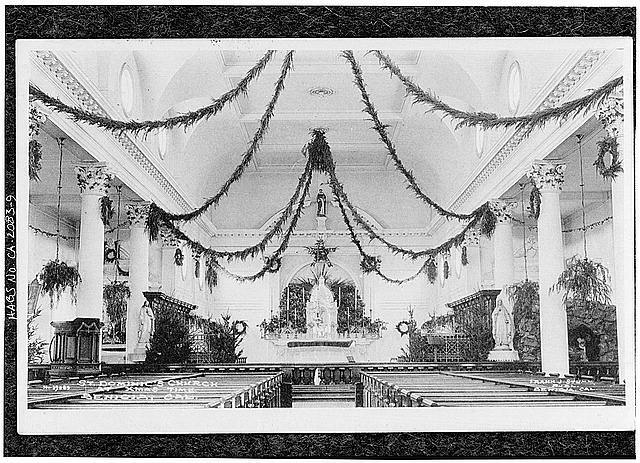 Before the beginning of the year 1859, thanks to the donations of the faithful of the city of Benicia, who, though few in number and destitute of the goods of fortune, nevertheless excel in generosity, the church was completed, a sacristy had been added together with a choir behind the altar, and all the debts were paid. There was then [in 1854] committed to our Brethren the care of the parishes of Benicia and Martinez, which latter is a town situated across the Sacramento River almost opposite Benicia. There was already a small church there under the title of St. Catherine of Siena. Both parishes then embraced a vast territory. The Church of Benicia was solemnly blessed by the Archbishop under the title of our holy Father Dominic on June 18, 1854.” Why did Fr. Vilarrasa come to Benicia? In the 1850s, Benicia blossomed from a town to a thriving city. Two major factors in the growth were (1) the establishment of the Benicia Arsenal; and (2) it lay on the direct water route between San Francisco and the gold fields beyond Sacramento. With the presence of the military and their families and the continual influx of “the forty-niners”, the city expanded in population and activity. Because of this, it was for a short time, the capital of the state. Even though the capital moved to Sacramento and the gold fields diminished in favor of the silver mines of Nevada, the completion of the railroads and the success of the Benicia-Martinez Ferry system ensured the continued growth and development of the community. In this way, Benicia was a natural place to locate the missionary and preaching efforts of the Order. With regard to his person, biographers describe Fr. Vilarrasa as a dark, rather short, man who wore glasses in his later years. In fact, his diminutive stature often required him to use a bench in order to be seen when he read or preached from the lectern. Once when he was reading the Gospel of John, he quoted Jesus: “A little while and you will no longer see Me; and again a little while, and you will see Me.” At that precise moment his footing shifted, his center of gravity unbalanced, and he fell off the bench. Demonstration can be a powerful form of sermon! In the following years, the Dominicans established parishes up and down the California Delta, e.g., Vallejo, Port Costa, Crockett, Antioch, Brentwood and Walnut Creek. With St. Dominic, Benicia as the Mother Church, the Dominicans formed a base from which the holy preaching effectively reached the developing delta area. Fr. Vilarrasa died on March 17, 1888, thirty four years to the day of his first Mass in Benicia, fifty years a priest, fifty-seven years in religious life, and seventy-three years of age. Fr. Vilarrasa was a different kind of missionary. He realized the importance of friars to be grounded in prayer. As Prior, Superior, or Provincial, he established houses of strict observance. He was a lone friar in a foreign land when he landed with Bishop Alemany and Sr. Mary Goemare. He persevered through many hardships, but saw to it that Dominicans would be in the West to pra ise, to bless, and to preach. For almost 160 years, St. Dominic’s has maintained a strong spiritual and academic presence in the once-state-capital town of Benicia, California. In 1854, the Dominican priest, Fr. Francis Vilarrasa, sailed from Monterey, where he had founded Santo Domingo Monastery, to the thriving city of Benicia. After arriving on March 16, 1854, the Dominican community occupied the property bound by East I and J between 4th and 5th Streets as a Dominican Seminary. In August of the same year, Mother Mary, who had made the first journey with Fr. Vilarrasa from Rome, arrived from Monterey with other Sisters and some resident students to set up school in Benicia. She bought several frame buildings in the hollow at the north end of 1st Street where she founded St. Catherine’s School. 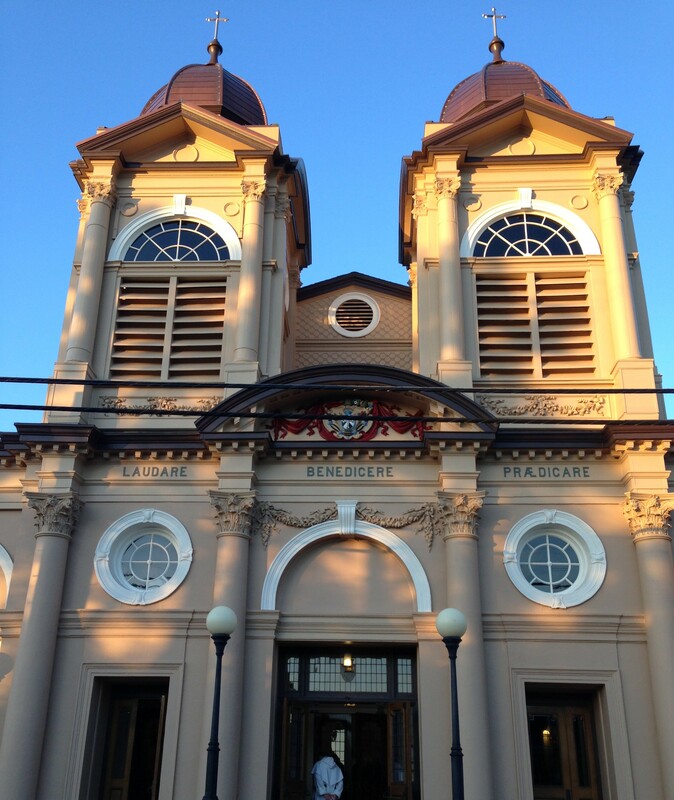 The Seminary grew and prospered with the building of St. Dominic’s Church, which was dedicated in 1890. In the early 1930’s, the Seminary and House of Studies were moved elsewhere. St. Catherine’s, however, was in continuous operation for more than a century until 1966, when ten of its buildings were demolished. The Solano shopping center now occupies the site. St. Dominic’s Rectory was built in 1956 and the old Semi- nary dormitory was torn down. In March of 1961, St. Dominic’s Parochial School was opened on the corner of 5th and East J Streets. This school is still in operation today. A committed community of parents, teachers, staff, and church congregation support its development. Together, St. Dominic’s Church and School provide a strong spiritual and academic presence in a growing Benicia. A nonprofit, tax exempt trust established to receive, manage, and expend funds exclusively for the restoration, repair, and maintenance of St. Dominic’s Church as a historical landmark. St. Dominic’s Church has been given landmark status by the City of Benicia, and is listed in the Historic American Buildings Survey. Memorial gifts are welcome, and all gifts to the trust are acknowledged.